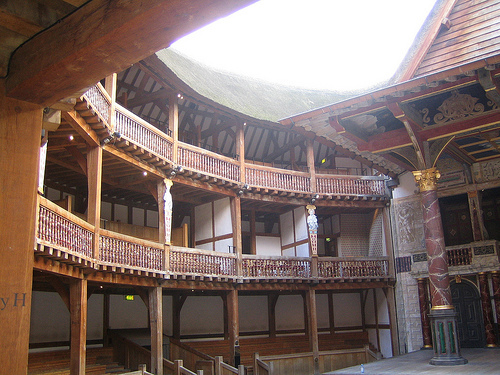 Yesterday I stood on the stage of the Globe Theatre. I could see every face of the group of students and the group of tourists who were having their tours. I could see the circle of sky, above me. I stood in between the terracotta, red pillars that couldn’t stop me thinking of a fat, raw steak. After this, I journeyed to a magical island, became a spore-emitting plant and put Ariel to bed. My class and I are lucky enough to be working with Globe Education over the next few weeks. We’ll be getting tangled up in the forest of A Midsummer Night’s Dream. Other classes in Southwark will be bewitched by mists of The Tempest or marching to the beat of MacBeth. Sometimes you have moments when it feels like the ceiling has caved in and you can suddenly see the blue of the sky through the roof; the light pouring in. If you do, make sure you look up.